Restaurant Week (dineLA) started today with over 200 participating restaurants - some more exciting than others. I've been looking forward to trying RH Restaurant at the Andaz ever since S. Irene Virbila's glowing review in the LA Times; it sounded so delicious. So, I grabbed a few friends for the special lunch prix fixe today. The service was wonderful - attentive and friendly - and we enjoyed a long, leisurely two hour lunch in one of their super comfy booths. The beautiful open kitchen with lots of top kitchen gear - my dream kitchen! 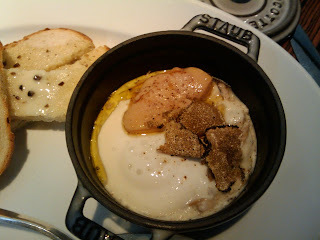 Perigourdine Poached Egg with field mushrooms, foie gras and summer truffle. This was not one of the choices for the prix fixe but I really wanted to try it so I paid $4 extra to substitute for it. Smart move because this was sooooooo good. 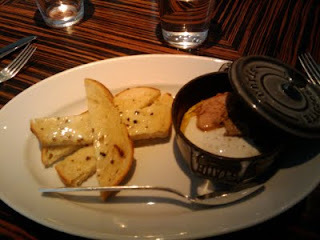 The mix of rich flavors from the runny egg yolk, perfectly cooked foie gras and thin slices of truffles combined with the toasted chewy bread was heaven in my mouth. I love that the dish came in a little cast-iron (porcelain outside) ramekin. I ate every last bit and had to resist every urge to pocket the ramekin and try to recreate "heaven" at home. Another hit for RH with this duck confit. 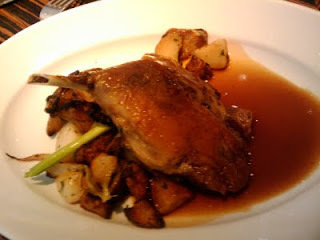 I've never had duck confit where the skin was actually crispy AND the meat was still succulent. Paired with the potatoes, this was a delicious entree. This was a miss for me. 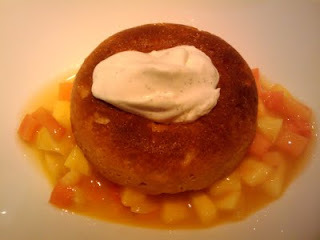 The sponge cake was a bit dry and I don't think it was really soaked it rum because it tasted bland. The best part was the fruit minestrone which was a mix of sweet and tart mango and papaya. However, I tried some of my friend's lemon grass ice cream and I think she got the best dessert; I loved the strong lemon grass flavor. I would definitely go back to RH again. I can't wait to have the Perigourdine Poached Egg again and try the terrines and the Perigord Tourrain Soup...and oh yes, having the Triple Fried French Fries again is a must (they're fried in duck fat). wow. that was fast. on the first day! Haven't been to RH for brunch, might have to check that out... That cast iron pan looks like an iteration of a dutch baby, with "better" stuff on top. Ah, right "dutch baby" - that's a better way to describe it. Btw, the Tourrain Soup is one of the choices for dinner prix-fixe. man, I didn't know you could just pay extra $4 to substitute for that foie gras :( That definitely looks much better than the pork/duck terrine that I had. 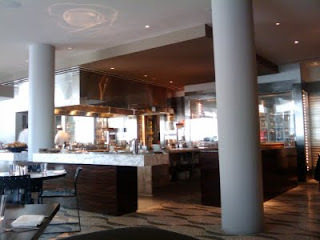 Nonetheless I liked the slow braised beef cheeks I had for the entree and had an overall good meal there for dineLA. Yiep, totally agree, the lemon grass ice-cream was both flavorful and refreshing at the same time. :) Thanks for recommending the restaurant Kat!